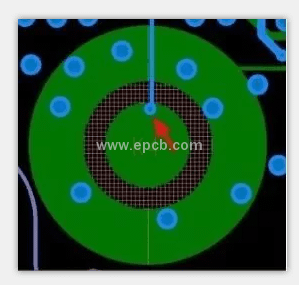 PCB design for manufacturing issues are very common during the whole board fabrication process. There are 5 tips for your reference in this article to avoid unnecessary issues in your next project. 1.Some pads on the PCB board are easy to peel off. As shown in the picture below, the leftmost ground pad of this brush soldering pad is easy to peel off in the process of debugging or rear-end maintenance, which will make the entire board to be a scrapped PCB. What cause this problem? We can easily see that the connection area between pad and ground is too large, so the heat conduction is very fast which cool the soldering process down very quickly, naturally it is easy to peel off when pulling. a.Blind holes are drilled on similar pads to make them connect with adjacent layers and increase the pulling force on the board. b.Use teardrop alignment on similar brush soldering pads, the reason is the same as above. c.Fabricating narrow-middle window on such kind of pad, so that green oil on the pad will have a certain pull. 2.Ground pad shall be cross connected. 3.You'd better not drill holes on the button center. If you put on the button center, it won’t work for a long time because the center contact friction is relatively large. 4.Make sure the silkscreen on PCB board is clear and neat. 5.Generally, tin is used to painted on the metal positioning hole. To avoid assemble issue caused by tin, it is not recommended to expose copper on the back of metal positioning hole, if inevitable, just expose a little copper.